Narratives of previously derelict buildings or should we record animal ‘graffiti’?? Since working on the ground floor of Kilmainham Gaol I have been forced to acknowledge that humans were the not the only inhabitants of this fortress. Indeed, they were not even the most recent habitants! As the prison was effectively abandoned when it closed in 1924 and was only actively ‘fixed up’ by volunteers in the run-up to the 50th anniversary of the Easter Rising of 1916 (most of the rebel leaders had been held here and were executed by firing squad in the prison yard) there were a number of decades in its recent history when humans weren’t the main occupants and they have left material evidence of this occupation. Through my own lack of foresight the impacts of the years of dereliction were not actively considered in any depth in funding applications or theorised beyond the conception that ‘dereliction = ruin = damage to the structures = graffiti as under threat resource’ (funders love things being ‘underthreat’!). However, on immersing into the fieldwork there is a need to consider how traces of abandonment – particular animal ‘graffiti’ can be included as part of the narratives of the site. Places that have been abandoned can reveal traces of this status through a variety of forms including animal identifiers. Of course the fact that various animals have left their marks on the walls of the gaol – and even obscured or destroyed the precious human graffiti – were not considerations I had overly thought about, let alone positively, before they forced their presence on me. The most frequent animal interactions with the gaol I have encountered are perhaps the least sinister (at least to my mind!). Whilst it was not surprising to see the traces of birds throughout the top floor (which had been roofless for many years) it was more unexpected to find that the enterprising few had also nested, perched and generally left an excremental trace in every part of the prison. The nests that were located on the top floor were also found – in lesser quantities – on the ground floor and it is clear that birds had explored, nested and even died across various parts of the three storey structure. The deep scratches, paw-shaped dirt dragged down the walls and their sheer volume left a material presence more pronounced than the human inhabitants. What was most surprising (and disturbing for me!) was that they left behind a wisp of an experiential moment I could share. In contrast to the rather static written and drawn graffiti of most of the human interactions with the walls I could follow a whirlwind of action across the floor-boards. I felt deeply uncomfortable in the cell – diligently searching for engravings and pencil marks – as my mind could not help but piece together what had happened here. I could almost ‘feel’ its presence. I felt this eerieness because I could connect the physical marks on the walls to motion, speed, attack, panicked movements and fear but because these were related to animals I felt reticent at recording them. I tried to rationalise why they should be recorded and why they were important and my internal arguments went something like this – the story of Kilmainham Gaol is not just about what happened ‘then’ and me, ‘now’, trying to reconnect to how this place could be explored and explained nearly 100 years later. The narratives of Kilmainham include what happened in the intervening years. I’ve already touched on the importance I place on getting some sense of what has been graffitied recently and why it was done in a previous blog (rather than dismissing everything after a arbitrary date as ‘modern intrustion’) but also the years of dereliction are an important aspect of the story. The discomfiture of the Irish state – in its many guises – with the powerful national(ist) narratives connected to the site are clear and have been articulated before now. Despite how important Kilmainham is to narratives of irish nationalism it was only adopted by the state in 1986. Why? This building is powerful. This is not because of any innate qualities it possesses but because of the things that happened in it, how they created and shaped the emerging and developing Irish state and how these have continue to have resonance in some (if different) form today. The ‘today’ of now is comfortable with the narratives contained within these walls, the state immediately post a bitter Civil War, were not. Therefore, the materialising of aspects of the prison that link to its period of abandonment are telling and important. Following the work of the ‘Ruin Memories’ project, and their emphasis on bridging the gap between when somewhere was abandoned and when we decide to study it, this dereliction tells not only that the site was once abandoned but also they reveal uncomfortable truths about the fear of such places in fragile, new states. Abandoned ruins, such as Kilmainham, act as ongoing interruptions of the past into the present – their very materiality demanding to know ‘what do we mean now?’ – and the reveal continued, if contested, narratives of the past. Whilst Cillian McGrattan when discussing the issue of the past in contemporary Northern Ireland, argues ‘the idea that not only does the present shape how we think about the past, but that the past is not entirely mutable since experiences and interpretations of events often endure’ (2013: 7). I would highlight that enduring material traces of difficult pasts also serve this latter function. 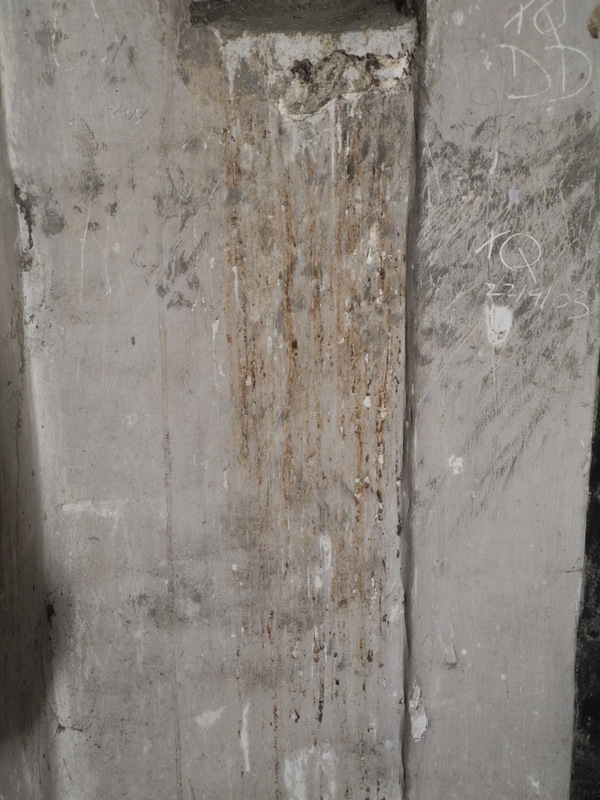 So the evidence of animal occupation – their unintentional ‘graffiti’ – and years of dereliction at Kilmainham are not just signs of the need for more thorough cleaning or that they negatively distort or hide the human graffiti. They are important indicators that the narratives of the site were not so comfortable or shared in times gone by as they are. They reveal that the site is not just about 1916 or 1798 or Eamonn DeValera, although these are all important, they are also about how the emerging state did not know how to articulate, use or deal with these narratives. These are just some thoughts on why animal ‘graffiti’ at Kilmainham has a role in the narratives of the site. 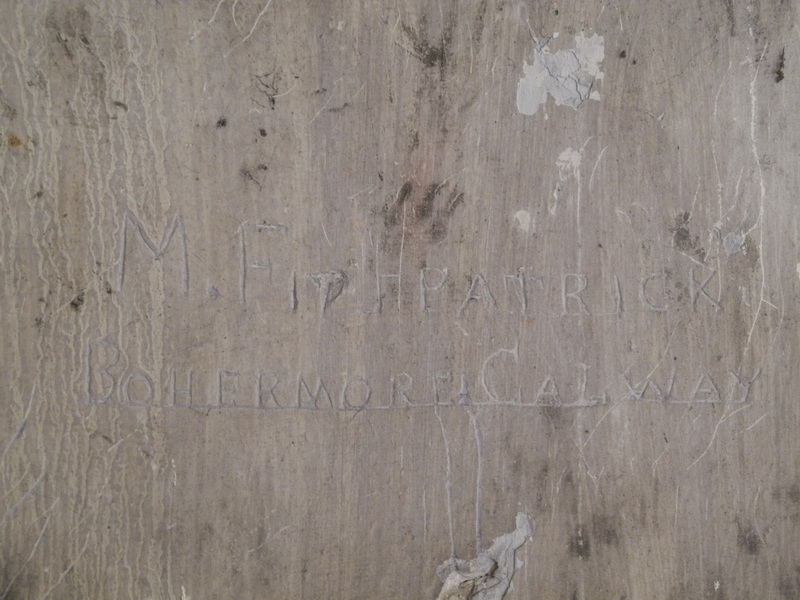 This entry was tagged #dereliction, #kilmainhamjail, #ruinmemory, Easter Rising, Graffiti, Kilmainham, Kilmainham Gaol, Prison. Bookmark the permalink. ← When does historic graffiti become ‘modern intrusions’?